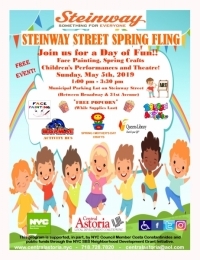 Come out and join us for a day of children’s fun activities. There will be Face Painting, Spring Crafts, Children’s Performances and Theater. BUSAMOVE will be parked for us, letting the children dance the day away and the Queens Library will be on hand to let the children gather reading material, on the go.